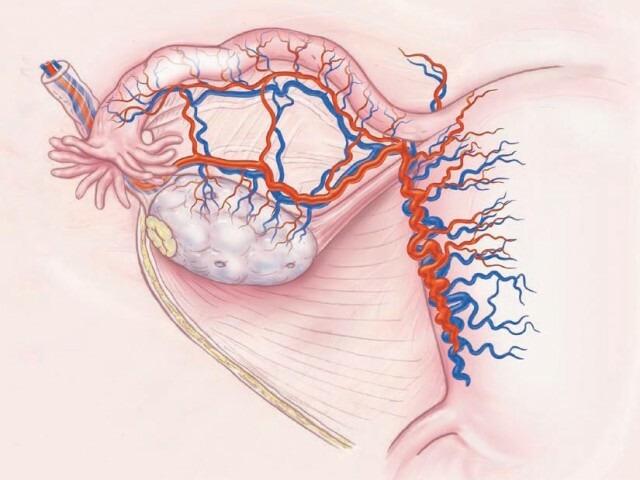 Cabergoline reduces the occurrence of moderate-severe ovarian hyperstimulation syndrome and probably does not have a clinically relevant impact on clinical pregnancy or on the number of retrieved oocytes. Valeria M.S. Leitao, M.D., Rafael M. Moroni, M.D., Ludimila M.D. Seko, M.D., Carolina O. Nastri, Ph.D., Wellington P. Martins, Ph.D.
To evaluate the efficacy and safety of using cabergoline for reducing the risk of ovarian hyperstimulation syndrome (OHSS). Systematic review and meta-analysis of randomized clinical trials (RCTs). Women submitted to controlled ovarian stimulation (COS) for assisted reproduction. Moderate-severe OHSS, live birth, clinical pregnancy, number of retrieved oocytes, miscarriage, congenital abnormalities. Comparisons were performed with the use of risk ratios (RRs) or mean differences (MDs) and their respective 95% confidence intervals (CIs). Eight RCTs were considered to be eligible; data from seven studies could be extracted and included in the meta-analysis. Cabergoline reduces the risk of moderate-severe OHSS (RR 0.38, 95% CI 0.29–0.51, 7 studies, 858 women) and probably has no clinically relevant negative impact on clinical pregnancy (RR 1.02, 95% CI 0.78–1.34, 4 studies, 561 women) or on the number of retrieved oocytes (MD 1.15, 95% CI −0.76 to 3.07, 5 studies, 628 women). However, our estimates were imprecise for distinguishing between substantial harm, no effect, and substantial benefit considering live birth (RR 1.03, 95% CI 0.71–1.48, 1 study, 200 women), and miscarriage (RR 0.69, 95% CI 0.27 to 1.76, 3 studies, 194 pregnant women). No studies reported congenital abnormalities. Cabergoline reduces the occurrence of moderate-severe OHSS. Cabergoline is unlikely to have a clinically relevant negative impact on clinical pregnancy or on the number of retrieved oocytes. However, we are still uncertain of its impact on live birth, miscarriage, and congenital abnormalities.